Each course offers challenging and interesting layouts for golfers of all skill levels. Let our professional staff take care of your every golfing need including instruction, golf car rentals, golf club rentals, pro shops, and tournaments. Visit the course home pages on this site for more information on rates, events, contacts, etc. Dynamic pricing is a price model which changes based on real time supply and demand. If you've ever shopped for a plane ticket or a hotel room online, you're probably familiar with the concept. Although many industries use a dynamic pricing model, it's a relatively new concept to the golf industry but one which benefits the golfer in many ways, including great golf discounts and tee time deals for more flexible players. The City of Longmont Golf uses a combination of season, day, time, and weather to determine its online tee time prices. Prices are determined based on a unique combination of factors, including the season, the day of the week, the time of the day, and the expected weather. If you're a golfer who has some flexibility in your schedule, it's typical that the highest prices will be in the early morning on Spring and Summer days when the weather is fair, but that they will trend downward the hotter it gets in the afternoon, or during colder seasons. For example, a fair Saturday morning at 8:30am in the summer will be more expensive than a hot Wednesday afternoon in the summer. Dynamic pricing discount golf rates will only be available for tee times booked online through www.golflongmont.com. (You can book your discount tee time now by clicking the buttons above and choosing the time and rate that works for you). Can I still book my tee time over the phone or in person? Of course! Keep in mind, though, that any tee times that are reserved over the telephone or in-person will be charged the rack rate and will not benefit from the dynamic pricing model. What if I have a membership or punch card already? If you are a member or have a punch card for our course, simply reserve your tee time online and pay upon arrival. We'll make any adjustments necessary at the time of payment. Can I use coupons when I come in to pay? In general, our coupon restrictions are printed directly on the coupons, so check your coupon first. Most coupons are applied to the rack rate and cannot be used in conjunction with our online dynamic pricing tee time discounts. Check for coupons in the ValPak or Longmont Times-Call inserts. For industries that have static products, dynamic pricing doesn't always make sense. But for industries that run on the calendar year, they only have a limited number of days and times to sell their product. For example, if a bed and breakfast is trying to sell rooms on a Wednesday night during low demand and only books 1 out of the 5 available rooms, come Thursday they will not have another opportunitity to recover that revenue for the entire year; the day and time is gone entirely. But if they price their rooms dynamically, a steep Wednesday ngiht discount might be just the thing to entice someone to book the room. Thus, they may not have paid full price, but with an expiring opportunity for operating revenue, selling 5 half price rooms is still a better deal than selling 1 full time room. This is why it makes so much sense for the golf industry, and for City of Longmont Golf. Sure, we're offering a steep discount for those afternoon tee times, but we'd rather fill up our tee sheet than see the game unplayed due to low demand. Wait a minute, doesn't this mean some tee times will be more expensive? Actually, because of the nature of golf prices and tee time expirations, you probably won't notice a difference in the high demand tee times. While it's possible high demand times might cost an extra couple of dollars, the new dynamic pricing model for Golf Longmont will be more of a promotion than a penalty. Give yourself the perfect reason to play golf at work: our pre-purchased Corporate Membership booklets are available to local businesses today! Membership booklets contain 25 coupons, each good for one 18-hole round that includes a golf car and range balls. There are no blackout dates and each coupon is fully transferable. Give one, two, or twenty-five to your best business customers! Use them for employee appreciation day. Or, invite your favorite clients out for a deal-making round any time of the season at Longmont's championship Robert Trent Jones II designed golf course. 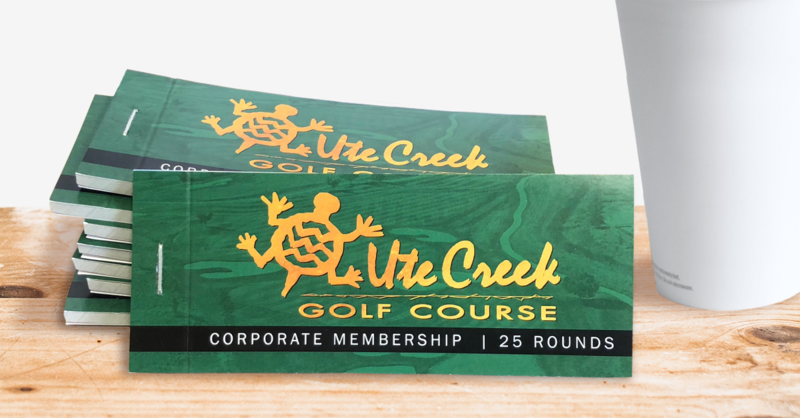 To order, visit the online shop, call Ute Creek Golf course at 303-774-4342 or stop by the course to pick your Corporate Membership books up. The more you play, the more you save! *No cash value. Valid for one 18-hole round golf for one person on one day at Ute Creek Golf Course. Each coupon/round includes golf car and range balls at the time of redemption. Reserve your tee time online at www.golflongmont.com and present your corporate membership coupon upon arrival. Ute Creek Golf Course is not responsible for lost or stolen coupons or booklets.